In whichever order you listen to the works on this disc, you will end up feeling completely shell-shocked by the unyielding barrage of emotions and musical styles it contains. Not only are these four composers from very different musical worlds, but even within each work the musical language is so varied and wide-ranging as to defy categorisation. This is an extraordinary piece of programming and, it must be said, a brilliantly effective one, too, which works so well because these are two such magnificent players. Taking the music in the order in which it appears on disc, we begin in a world which lurches unashamedly from Erich Korngold to George Gershwin to Alban Berg and to Astor Piazzolla, delves into a 1920s night club and shakes a leg at the streets of New Orleans, as if from the comfort of a plush cinema sofa. It has been described as kitsch; but Tango Song and Dance by André Previn is much more than that, even if its musical language seems like a random sampling of early 20th century fads. 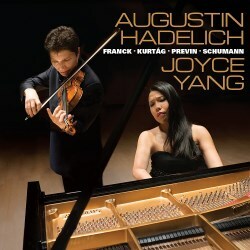 Written for Anne-Sophie Mutter (at which time they were still husband and wife), it is as genuine an expression of love as you could imagine in musical terms, and while Mutter and Previn recorded it for DG in 2003 in a memorable performance, which oozed love and mutual affection, I find in the Augustin Hadelich and Joyce Yang partnership a freer feel, less constrained by the overwhelming sensation of “luvviness”, and more intrigued by the switch-back ride of stylistic toe-dipping. Their final flourish, Hadelich launching off on his upward spiral, while Yang anchors it all firmly to the ground with some tremendously solid piano chords, is superb. In many ways the Previn offers the key to the programme; human relationships and feelings. We have had love from Previn, and next we have anger from Schumann. He wrote his first Violin Sonata in the wake of a heated argument with the deputy mayor of Düsseldorf, concerning Schumann’s conducting of the city’s choir. Not only does the Sonata inhabit a stylistic territory about as remote from any of those touched by Previn, it also seems a world apart from it in its unease and pointedly direct gestures. It has, as Hadelich writes in the booklet notes (which take the form of a conversation about the music between Joyce Yang and himself), “violent mood swings”. If the duo partners had managed to convey a strong sense of love and affection, while standing a little outside the emotional world of the Previn, they do the same with equally impressive results with Schumann. Those mood swings are vividly conveyed, the passionate outbursts of the first movement, abruptly giving way to the more introspective second, in a way explained by their joint view of the music as “telling a story” (they even go so far as to outline their opinion as to what that story is). They bring a biting, brittle edge to the jagged figurations of the third movement, like two swordsmen fencing the occasional thrust. With the Franck Sonata we enter yet another new world of human emotion and musical language. This is far more than a composer’s feelings at the marriage of a friend, and the passionate, explosive, deeply affecting and at times almost unbearably intense journey the music takes over its four movements seems to encapsulate a whole range of human emotions, not all of which one suspects Franck would have wanted the world to recognise. Not for nothing does it stand at the pinnacle of 19th century violin sonatas, and while its language might at times seem orchestrally (or, perhaps, organistically) conceived, here we have two players, who are clearly attuned to each other’s approach and understanding of the score, as well as having that instinctive feel for each other’s nuances that brings the whole thing together in one soaring exhibition of drama, feeling, virtuoso display and interpretative conviction. Their perfectly measured silences, as the second movement returns to its turbulent self are masterstrokes, and rarely on disc have I heard the third movement delivered with such consummate balancing of emotional substance and tonal poise; its final moments are truly inspired. The music on this disc might offer up a roller-coaster of a ride, both emotionally and stylistically, but it is handled with such masterly self-assurance by this remarkable duo that all one wants once it has run its course is to go through it all over again.